When a lethal alien creature crash lands on Earth, a ragtag group of soldiers must fight to survive. The Predator starts off well with the opening sequence of sniper Quinn McKenna (Boyd Holbrook) encountering the predator for the first time. It’s an exciting scene that shows how deadly the Predator is and what humans are up against. McKenna takes some of the creatures’ tech and mails it to his home as he thinks no one will believe him. There his son Rory (Jacob Tremblay) opens the box and starts playing with it, putting himself and everyone around him in danger. The actual plot leaves much to be desired with the films own established logic frequently being ignored. For instance, bullets are seen to have little to no effect on the Predator, but these characters still keep shooting it. It also tried to fit in a lot of scientific reasoning as to why the Predator had come to Earth, connecting it to some of the previous films while doing so, but it didn’t really work nor was it needed. For an action/horror film, there’s a lot of jokes in this film, and barely any of them land. Every single character’s defining trait is “they’re funny” which not only makes it hard for any of these characters to stand out, but when the film tries to have a serious moment between characters it doesn’t work. There’s one moment where something happens that I expect was supposed to be sad and poignant, but people laughed. Sterling K. Brown plays the government bad guy and he’s supposed to be intimidating and scary but because he’s cracking jokes in every scene he’s in, he just doesn’t feel threatening. 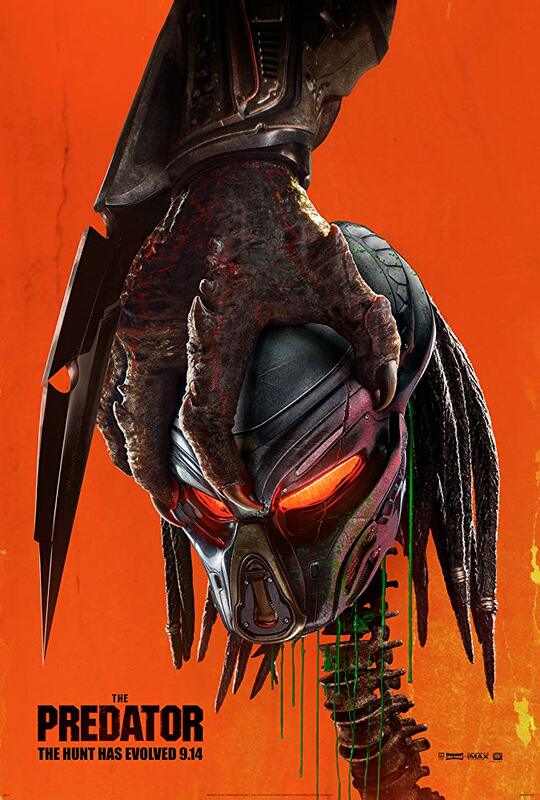 The action is generally well shot and exciting and there is a lot of blood and gore as the Predator violently kills just about anyone it encounters. However, the editing was a little odd and inconsistent at times. People and cars move between shots and are suddenly in different places making some sequences hard to follow. The Predator is an easily forgettable film. Even while writing this review, I was struggling to remember anything that really stood out, both positive and negative. It’s mostly fun, though Tremblay’s character having autism and it being used to further the plot in a stereotypical way is problematic, but it also has nothing to make it memorable in terms of the genre or of the franchise it’s a part of. 2/5. Los Angeles 2028. Hotel Artemis is run by the Nurse (Jodie Foster) and it’s a place for criminals to lay low and get patched up. The Hotel Artemis has an important set of rules, including no guns and no killing the other patients. But with riots on the streets and high-end criminals checked in, tensions begin to boil over. Hotel Artemis does a lot of clever world-building in a very short period of time. There’s riots on the streets over clean water, rich people are desperately trying to place their valuables in the bank to avoid looters and rumours of an all-powerful mob boss. The look of the hotel, how it and the various medial equipment seems to be on its last legs, it makes the hotel almost a character of its own. Waikiki (Sterling K. Brown) is the main character of the hotel guests and thus gets the most development. When it comes to fleshing out the other characters there’s assassin Nice (Sofia Boutella) followed by scumbag Acapulco (Charlie Day). If you’re thinking all these names are a bit odd, that’s because the guests of the hotel are named after the name of their suite. All actors do a good job with what they’re given though it is Jodie Foster who’s the standout. The Nurse holds it all together as she goes from room to room, patching up guests and attempting to keep other people out of the hotel. She’s sweet lady that’s somehow ended up healing criminals, she works in a morally grey area but she’s someone who believes in the rules and is a good person at heart. 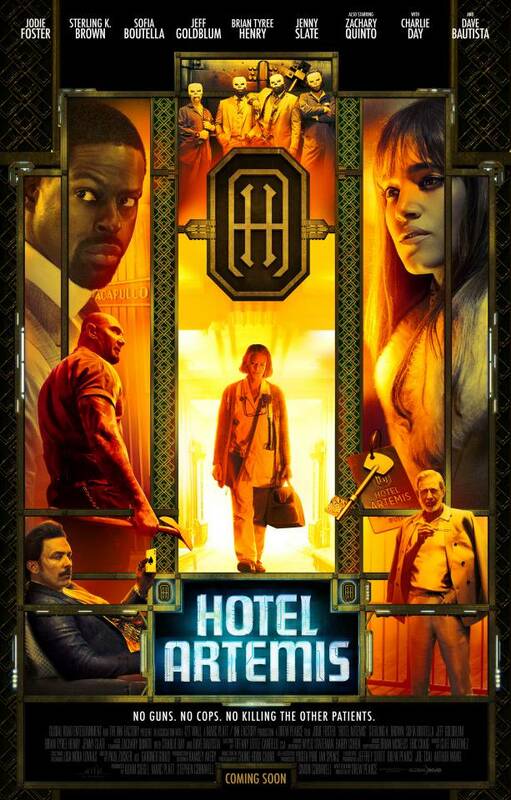 Hotel Artemis isn’t particularly an action film. Towards the end there’s a big fight but really, it’s a character driven film and the main plot is about not letting certain characters learn about other characters who may or may not be in the hotel. It sounds more complicated than it is and it would’ve been nice if there were more than one scene where multiple criminals were in the same place at once. That one scene was funny, compelling and tense. Hotel Artemis does lack a spark of something to make it great. Perhaps it’s because, for some reason, I thought it was going to have the same sort of manic humour as Free Fire. But really while there are a few jokes, most of which come from Dave Bautista’s Everest, it’s a more serious drama about criminals. With its 90 minutes runtime, Hotel Artemis doesn’t really let up. There’s a lot happening with these characters but the film doesn’t do enough to be memorable. 3/5.